If you have not already done so, please install Storage Helper from the AppExchange. Click each section to learn more. Storage Helper can be configured to run in a conservative mode, or a maximum savings mode. Conservative mode will delete your data at a low risk level of not being able to recover data that was lost to accidental deletion or a change in a business requirement that affects the criteria of data that needs to be kept. Maximize storage savings mode will increase potential Data Storage savings. Assign the Storage Helper Permission Set to all Admin Users that should have access. Click the gear icon for Storage Helper Settings. Set the Maximum Number of Records to Recycle. an unlimited number of records. will back up all of the records from a Storage Recycle Job, however, you must have selected a backup option at Storage Recycle Job level (available for selection after creating your Storage Recycle Job). For additional peace of mind, we HIGHLY recommend enabling Storage Helper backups in addition to backing up all of your Salesforce data through weekly exports or other methods. Please see the Storage Helper Backups section for more details. through all of the records. than 20,000, there is a risk of data loss for the settings that do not have backup selections. Enter the Alert Threshold Percent representing the Data Storage utilization level at which you would like to receive notification. Enter the email address(es) to send the notification to. activating the Storage Recycle Job. cost per 500MB/YR for accurate savings calculation. Select “Auto Delete Old Storage Helper Backups” if you would like Storage Helper to delete old backups after a period of time that you define. Once selected, there will be a popup to enter the number of months to keep the backups. Select “Track Monthly Data and File Storage” if you would like a monthly comparison of data and file storage usage. Select “Track Monthly Object Storage Usage” if you would like visibility into which objects are consuming the most data storage on a monthly basis. Select Storage Helper Run Mode. You may either select the method by which you would like Storage Helper to run now by clicking the Change Run Mode button, or return to this step after creating your Storage Recycle Job(s). From the Gear Icon, click the Change Run Mode button. In the Run Mode popup select how you would like Storage Helper to process Storage Recycle Jobs. Manual Run Only - By selecting this option, Storage Helper will not automatically run. Run After Salesforce Data Exports - Storage Helper will run the Storage Recycle Job(s) you have activated after each export has completed. Run on a Defined Schedule - Allows you to schedule when you would like Storage Helper to run. If you do choose an automated option, you can still manually run at any time by selecting the Run button in the upper right corner of the All Storage Recycle Jobs page. Next to the Gear icon, you will also find an FAQ button for in app answers to FAQs. Create Storage Recycle Jobs to delete data that you no longer need. Click the New Storage Recycle Job button in the upper right hand corner of the Storage Recycle Jobs page. Select the object to clean up. Optionally select to Hard Delete Records. By selecting this checkbox, records will not be sent to the recycle bin. Select child objects to be deleted along with the parent. If they are not selected, they could block the parent record from being deleted. Create desired filter criteria to ensure the correct records are deleted. You will need to select the field to filter on, choose the filter logic, and select the condition that should be met. functionality should only be disabled in certain very specific cases. 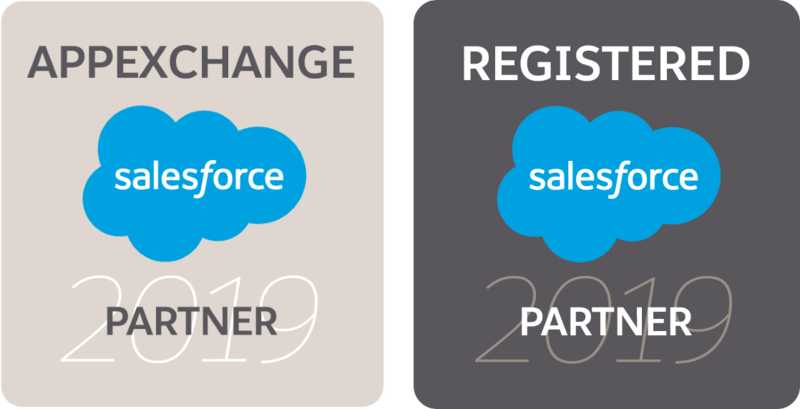 See our section, Export Backup Data from Salesforce, to learn more about backing up your data. If you delete a Storage Recycle Job, all of the backup files for that setting will be deleted as well. You would need to download the files and save them elsewhere before deleting the job. Deleting a Storage Recycle Job will also delete the filter that was associated to it. restore any records that were mistakenly deleted due to inaccurate filter criteria. Note: A maximum of 300 fields will be queried. Select “Enable Search for Archived Records” if you would like to be able to search and restore records from the backup file. inactive until filter criteria are fully defined and matching records have been previewed. In the Detail tab to the right, you can preview records waiting to be deleted by a Storage Recycle Job, edit the Storage Recycle Job, activate the job or delete the job. In the Criterion Tab to the right, you can review your criteria and edit/delete, add new criteria, or change your Filter Logic. after running the Storage Recycle Job by using the View Backup Files tab. Enter the full or partial name of a record. Select “Restore Record” next to the Archived Record Name to restore the record to Salesforce. Select “Download Backup” to download a file of that record. dashboard of Monthly Data and File Storage Comparisons and the Top Ten Storage Consumers. Objects with high usage will display on the Storage Usage Analytics page. This section will display possible opportunities where records could be deleted to help your organization save money on storage. You can manually export data, however, it is best practice to backup your data on a scheduled basis. There are different options for data backup outlined in the blog article. One option is to use Salesforce Data Export. Backup your data. The Storage Helper backups option will backup all records that are to be deleted to a .csv file. We do also recommend regular Salesforce data backups for all of the data in your org. Use the alert threshold notifications so that you can run Storage Helper jobs to mass delete data before going over the Salesforce Data Storage Limit. Use Storage Usage Analytics to identify the largest storage consumers in your org and identify monthly data usage trends. filter criteria can be verified before the job is run. Collaborate with all stakeholders to define what data is necessary to keep and when data is considered to be no longer necessary and can be deleted. Leave “Hard Delete” unchecked so that records can be recovered from the recycle bin if necessary. The Storage Recycle Jobs tab is the control center for setting up Storage Helper, configuring your Storage Recycle Jobs and retrieving your backup files. There are also tabs for the ability to search and restore records to Salesforce and viewing Storage Usage Analytics. 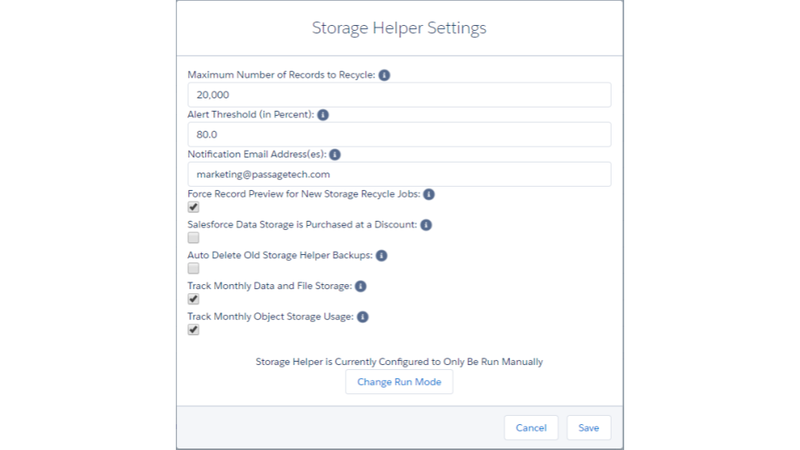 Storage Helper Settings is where to go to set your alert threshold and notifications, run mode and how many records to recycle, to track storage usage, force record preview before deletion and identify if you have purchased Salesforce Data Storage at a discounted rate. NOTE: With either a manual or scheduled run, be sure to backup your data first. Recovering data that has been lost is extremely costly. You can find more information regarding Salesforce Data Recovery in the How to Avoid Hitting the Data Storage Limit blog in the Storage Helper Use Case Library or use the Storage Helper backup options. Do you have any cool Storage Helper Use Cases in mind? Please share below!